It’s ho, ho, ho time in this hilarious and wacky Florida holiday tale, featuring bighearted psychopath Serge Storms and his sidekick, Coleman. Like Santa, Serge knows who’s been naughty and who’s been nice. Few can give with the generosity and creativity of Serge, and as December 24 rolls around, he is filling up the Serge sleigh with an unforgettable bag of presents. But before that, it’s all a big free-range Christmas office party, where Serge will be spreading his special cheer. And there’s that last-minute go-for-broke spree at the mall (just beware of those attacking elves - they bite). While you’re there, skip the lame photo on Santa’s lap - Serge will give you a lap ride you’ll never forget. As for that addled elf Coleman, there’s nothing like a white Christmas. Let it snow! So grab a six-pack, spike the eggnog, and hit the dunes on the beach as Serge and Coleman roast some nuts on an open fire and prove that reindeer really do know how to fly! I Don't Know about Joyous but Nutbars REALLY Fits! Sometimes I wonder why I even bother to read the reader reviews -- because I decide to disregard their advice. For instance, many reviewers suggested that a person totally new to the Serge A. Storms series of stories NOT start here. They said to start at the beginning, or at least listen to or read the first novel of the series before this book. Well, I decided to ignore that advice and started here. Okay, this story does not include nearly as much Florida history and not as many crazy Floridians as the first novel of the series, but this book might fit into the series the same way the "between the Plums" fit into Janet Evanovitch's Stephanie Plum novels. It really doesn't matter. 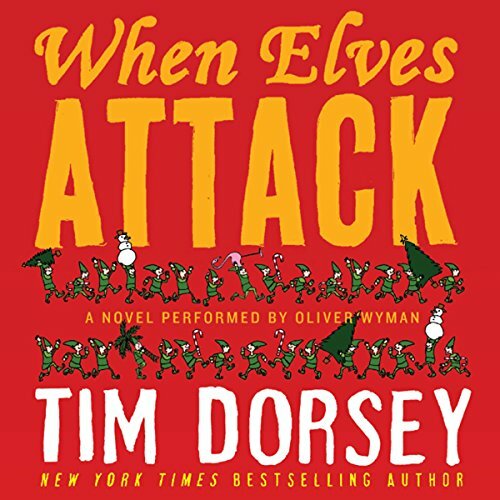 When Elves Attack is funny and quirky and made me "KNOW" I have to listen to the entire series as soon as possible. So, as soon as the speakers on my laptop spit out "We hope you enjoyed this book," I was at the Audible website to get Florida Roadkill. As soon as part one finished downloading, I started it playing. It's going to be very hard to wait for credits to arrive to complete the collection. But ... my local public library doesn't have any of the Serge A. Storms novels available in audio, so ... **sigh** I'll have to be patient. "When elves attack" is a laugh out loud story beautifully performed and masterfully crafted. Sometimes even bad guys have good hearts. I could easily cast the movie based on the vivid character descriptions, now if they would just make the movie. My wife loved it as well and we will now purchase several copies for gifts. May not be as good as a "yule log" but I am sure they will be happy anyway. Wow! Tim Dorsey did it again. Non-stop action and hijinks that only Serge and Coleman can do, and in their own way. Many of the quirky characters from Serge's past are here to celebrate the season with this somewhat heartwarming holiday tale. My only complaint is that our time spent with Serge is just not long enough. If you haven't heard the Serge tales, this is probably as good as any to start.As the characters are from other books, you might want to listen to Triggerfish Twist, Stingray Shuffle and some others as well. Dorsey's characters are creative, twisted, and colorful as he takes his swipes at Florida's foibles. Mr. Wyman does his usual superb interpretation. Treat yourself to a wild Christmas present in this book. I love this author and the performance was great. Only problem is, I just can't get over the Joe Peschi voice of Serge. A Serge Storms treat for the Holidays! Serge and Coleman are back for a special little holiday treat! What else is there to say? It's psychopathic vigilante Serge Storms and substance abuse sidekick Coleman putting their particular brand of bizarre spin on the season. Followers of Tim Dorsey's tales will remember Jim and Martha Davenport from Triggerfish Twist and Atomic Lobster. Alas, the poor couple are (again) thrown in the middle of a not-so-fictional modern day economic mess. Serge to the rescue, along with help from the G-Unit Grannies, to sort it all out, eliminate bad guys as only Serge can, and triumph for a Merry Christmas to all and to all a goodnight! I bought this book because Audible recommended it under the mystery/thriller genre in their festive seasonal suggestions. Previous reviews said that this book was laugh out loud hilarious but I didn't laugh once, which was a huge disappointment. I listened to almost all of it - about 30 minutes from the end - when I just couldn't take it anymore and gave up. The performance by Oliver Wyman was fine, it didn't hurt or really help. I wouldn't recommend this book. This will keep you rolling! I love this series, can hardly wait for next book! Very good, but not Dorsey's best. Would you consider the audio edition of When Elves Attack to be better than the print version? The usual craziness of Serge and Coleman. Excellent as usual. Does a great job of capturing the bizarre characters. A good story with enough wit and interesting twists and turns to be a fun read.